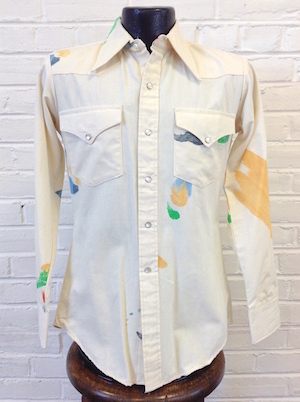 Home > Vintage Western Shirts > XS & SMALL Western Shirts > (S) Vintage Mens 70s Western Shirt! Off White w/ RaInbow Paint Splatter Marks! 3 Available! 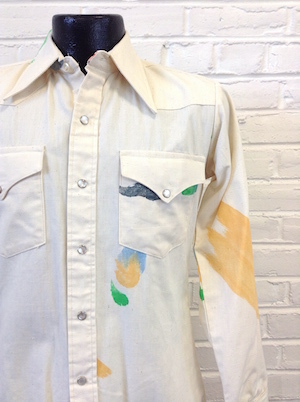 Vintage mens 1970s long-sleeve western shirt! Off-White base with a paint splatter pattern in a variety of rainbow colored colors including yellow, blue, orange and bright green! Has a super wide 70s collar. Closes in the front with pearly white snaps with two matching snaps on each cuff and on the pockets. Has a tapered hem. Tagged by MWG Johnny West. No material tag, but feels like cotton or a cotton blend. We have three shirts in this style available. The pattern on each shirt may vary a little from the shirt pictured. Shoulders: 16.5" Please check your measurements as the shoulders a tad bit smaller than an average SMALL..